With a fourth explosion rocking the Fukushima nuclear plant on Tuesday, danger of the spent nuke fuel pool boiling and radiation levels at the facility's gate increasing hundredfold, fears of a meltdown in Japan skyrocket. 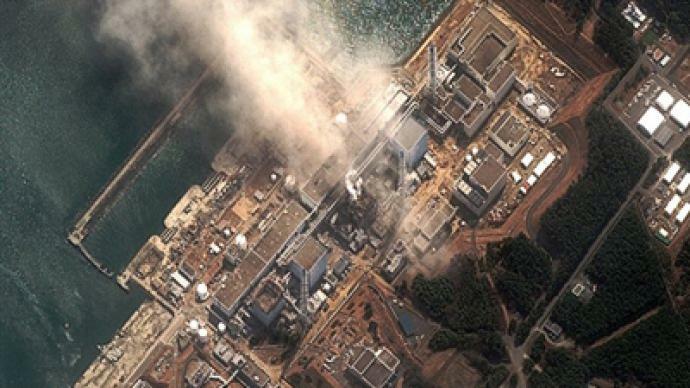 Smoke was seen floating above Unit 3 at the Fukushima nuclear plant on Wednesday, following a second fire which broke out at Unit 4 hours earlier. According to a spokesperson for the Tokyo Electric Power Co., the smoke could indicate that the water in the fuel pool inside the reactor is boiling, the AP news agency reported. Authorities have suspended all work at the plant, which was intended to prevent the facility from melting down, as the surge of radiation makes it dangerous for workers to remain onsite. The level of radiation at the plant reached 10 millisieverts early Wednesday, later dropping to 8-6 millisieverts. Experts say that a contamination level of 10 millisieverts is enough to cause radiation sickness. Japanese officials announced earlier that 70 percent of the fuel rods at one of the six reactors of the Fukushima plant are damaged. Over 30 percent of fuel rods at another one of the plant’s reactors are also damaged. The government has ordered about 140,000 people living at the vicinity of the plant to stay indoors. 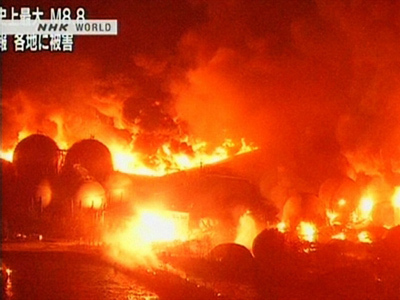 Another fire broke out at Unit 4 of the Fukushima facility earlier on Wednesday. The plant operator, Tokyo Electric Power Co., announced that firefighters are trying to put out the flames. According to the company, the new fire started because the initial blaze was not extinguished completely. The latest, fourth, hydrogen explosion at Unit 4 of the Fukushima facility resulted in a massive fire at the spent fuel storage pond, which reportedly contains over a thousand spent fuel rods. It is said to have damaged the storage pond area and staff were struggling to cool it down. 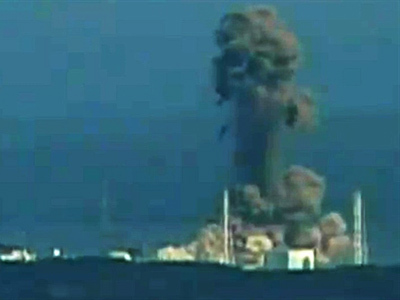 Unit 4 itself was not operational, but the hydrogen is believed to have released radiation, the Associated Press reports. Fukushima plant personnel plan to remove the roof over reactors 5 and 6 to prevent hydrogen concentration and new blasts. The explosion followed another blast, which hit the facility’s Unit 2 just hours earlier. The country’s nuclear safety agency has announced that it suspects the explosion may have damaged the reactor’s container. AP has quoted an agency spokesperson, Shinji Kinjo, as saying that "a leak of nuclear material is feared." The operator of Fukushima Dai-Ichi nuclear power plant reported earlier that the cooling system of Unit 2 was fully down, which could lead to overheating of the unit and an explosion similar to those that occurred on Friday and Monday. They admit meltdown is a possibility following the four explosions at the complex. News agency Kyodo has published a status report on the Fukushima reactors. As of Tuesday evening, local time, all four reactors at Fukushima-2 plant have been shut down after cooling failure. The Fukushima-1 reactors however remain of great concern. Three reactors, which were operational at the moment the earthquake struck, are all either confirmed or suspected to have gone into partial core meltdown. Reactor number four also poses a threat despite being under maintenance at the time, because the fire, which followed an explosion of hydrogen, damaged the pool holding spent fuel rods, and the contaminated water may be seeping through. The company that owns the plant has reportedly withdrawn over 700 workers – first leaving only 50 to deal with the disaster, but then withdrawing them as well due to a high radiation level. The engineers had been using sea water to cool the reactors in an attempt to avert a nuclear disaster. The incident at Fukushima-1 nuclear power plant has been assigned the sixth level of emergency out of seven according to the INES (International Nuclear Events Scale). Japanese Chief Cabinet Secretary Yukio Edano confirmed on Tuesday that the radiation levels near the gate of the stricken plant soared to 11930 microsieverts an hour, thousands of times higher than readings before the blast, according to Reuters. That is the equivalent of three years worth of naturally occurring radiation being emitted within a single hour. 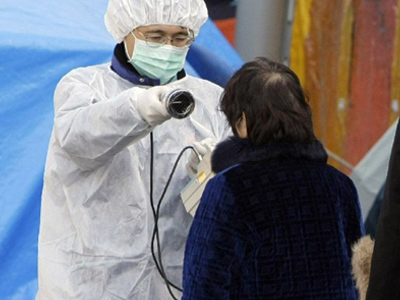 By 3pm local time (6am GMT) the radiation level was reported to have dropped by 20 times to 596 microsieverts. The wind blowing around the plant is Tokyo oriented. Radiation dosage meters located in the capital have registered a radiation increase, but the level is still regarded as safe, Tokyo authorities are reported as saying by Kyodo news agency. All residents within 20 kilometers of the quake-damaged Fukushima-1 nuclear power plant have been evacuated, says Japan's National Police Agency as reported by NHK broadcaster on Tuesday. Police are patrolling the 20 to 30 kilometer radius area around the plant and urging residents to stay indoors with their windows shut. According to weather simulation results released by South Korea's Meteorological Administration on Tuesday, most of the radioactive particles from Japan's damaged nuclear plant in Fukushima will drift toward the Pacific Ocean. The agency conducted the simulation using the latest weather data to find out how the radioactive particles might spread in the next 24 hours, Japan’s Kyodo news agency reported. The explosions at the nuclear facilities since Friday's earthquake and tsunami have damaged the cooling systems. Several people have been injured in the blasts, while more than 150 people have been exposed to radiation. The National Police Agency has released new figures on the victims of the quake and tsunami. The data says 3,373 are dead, 6,746 missing and 1,897 injured in 12 prefectures. Many unidentified bodies have been detected in quake-hit coastal areas, and will inevitably raise the death toll. ­The grim reality is that excessive radiation levels are being detected further and further from the Fukushima-1 nuclear power plant and it is clear the situation is out of control says Dr. Robert Jacobs from the Hiroshima Peace Institute. 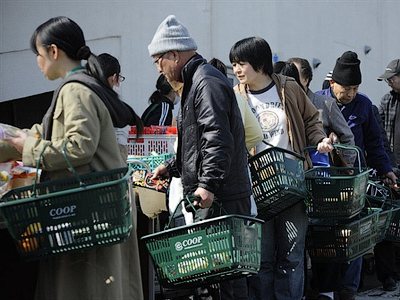 He adds that its consequences will be devastating for communities and people’s health in Japan. “There is a growing distress among people in Japan that the information we are receiving is not informing us to the extent that we would like. That does not reduce panic, it just makes people more and more uncertain. They believe they cannot fully trust the information they are being given,” he said. Placing nuclear power plants in earthquake zones really increases dangers but the main threat of nuclear power as an energy source remains the danger from spent fuel and materials, believes Jacobs. ­Vladimir Saenko from Nagasaki University reminds that though radiation is a natural component of everyday life, its potential threat to health depends on the dose a person accumulates. Saenko admits that the radiation level reported at the Fukushima facility is very dangerous, but the level reported over Japan is still in accordance with the norm. In addition to staying indoors, wearing protective clothes and masks in order to gain protection from a radiation overdose, people are recommended not to consume food in the streets or that has been exposed to the radiated air. If a person suspects that he has received a high dose of radiation, he should immediately seek medical advice, concludes Saenko. ­Despite the radiation leak at Fukushima-1 nuclear power plant it is not as disastrous as it was in Chernobyl, but even a tenth of that would be too much, warns Professor Eli Stern, the head of the Center for Risk Assessment at the Gertner Institute of the Sheba Medical Center at Tel Hashomer. 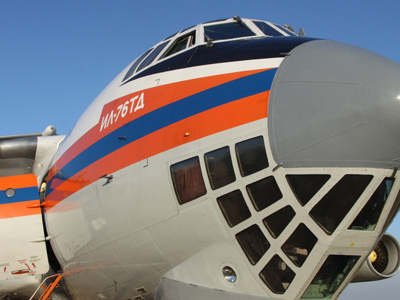 “In this case, if worse comes to worst the Japanese will have to very seriously consider the measures that were taken in Chernobyl, which means to put the damaged core in a big cement sarcophagus to prevent further contamination,” the professor believes. ­The situation at Fukushima plant is already the worst case scenario and many experts do not trust the information released by the Japanese authorities and it is evident that the meltdown in two reactors has already occurred, shared Igor Khokhlov, fellow with the Institute of World Economy and International Relations. “The amount of radiation released now and the amount of radiation that will be released [at Fukushima nuclear power plant] is so great that actually the whole globe will be affected,” Khokhlov estimated, comparing one energy unit affected in Chernobyl and three nuclear power units affected at the Fukushima plant. “Definitely, it is going to be one of the worst nuclear disasters in world history,” he concluded. ­Arjun Makhijani, president of the Institute for Energy and Environmental Research in Washington, told RT that the situation at Fukushima is extremely difficult due to the very low numbers of workers and engineers fighting to cool the reactor. “From the point of view of disaster management and accident management, this situation is extremely difficult, because now there are only 50 workers trying to contain and manage four different accidents and potentially two other reactors as well,” said Makhijani. ­The former chairman of the largest US public power company, Tennessee Valley Authority, Glenn McCullough, believes that Japanese authorities are doing their best to tackle the ongoing situation. 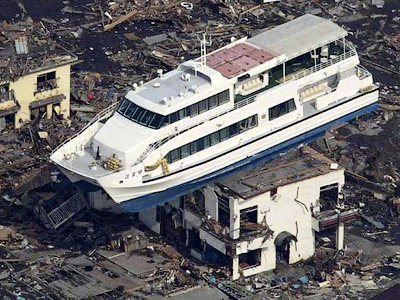 Peter Wynn Kirby, a specialist on Japanese society from Oxford Brookes University and author of the book “Troubled Natures: Waste, Environment, Japan,” said the problem is that numerous decisions led up to this situation.